In the 2002 John W Walter documentary How to Draw a Bunny Ray Johnson talks about an element within his own practice he refers to as ‘moticos’. Johnson likens these small packets of collages, photos and found material to the flashing glimpses between the cars of a passing freight train: a moment in which the majority of our vision is temporarily obscured, save for a tantalising sliver of detail at the edge of the image. He claimed they were everywhere in our daily life; all we needed to do was learn to see them and we’d be richer for it. It’s a suggestion which also rings true when looking at the work of Jo Addison and Alice Walton. Walton’s collages and drawings are similarly concerned with the nature of how we see and assess the images around us. That Walton originally took as source material pages rent from jazz mags, and that she continually seeks to erase the female form, suggests a politicisation in the work. However, latterly she has primarily been using pages culled from second-hand art history books that often feature women. These figures are then crudely obscured using tape or paint, leaving only the surrounding architecture of the original visible. It would be all too easy to claim this for a feminist revision of the misogyny of art history, or of visual culture more generally, but that would also be misleading. The work takes a broader view. In her sculptures, too, the use of materials, siphoned from the world around and manipulated to new and sometimes obscure ends, is key. Walton’s method of construction through simple acts of appropriation directly asks the viewer to question the nature of what they are seeing: how the image is constructed, not in a literal fashion but in terms of the content. It is a simple yet very effective device to overtly obscure an image whose internal mechanics and structure may appear familiar yet, in doing so, not present a political dialogue but rather an experiment in visual language. Walton separates the process of looking from understanding and lays them side by side, yet what you see and what you get will very much depend on you. The evocative image of the cityscape glimpsed between the edges of the train carriages has a cinematic resonance within the context of Addison’s sculptural constructions. The pared-back, muted tones of the work, its reduced and apparent physical simplicity, suggest an empty banality. But these are objects as mediums, single frames of film that describe the entire scene. Continually reworked and simplified to their core, Addison’s sculptures come to represent a universality of experience of time and place. They are everywhere and nowhere, her greys are those of the multi-storey car park and the motorway junction roundabout at 3am. Her’s is the furniture dumped in the brambles at the edge of the park. 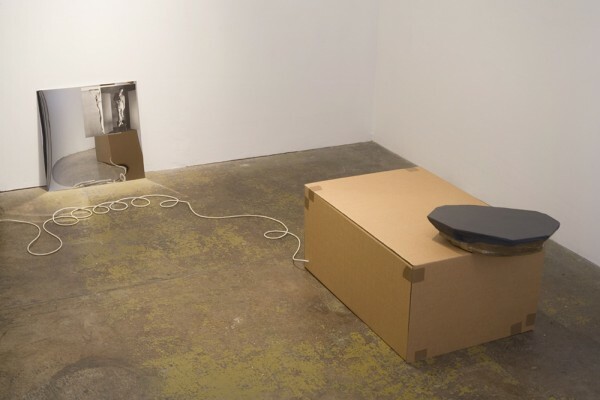 Yet despite their aspirations to universality these objects command a very personal response. The tension at the centre of the work is the conflict between the very personal response to the evocative object and the often universal nature of those non specific, momentary experiences of time and place. Addison’s constructions are the starting points for an internal journey in which the object may be long forgotten before we realise where we’ve gone. The emotional and intellectual preconceptions we bring, as viewers, to the work of both these artists will determine our visceral response to them. In different ways they both require an assessment of our reactions and assumptions about them by asking how we got there in the first place. Often, however, this is not explicit and can only really be understood by looking at the edges to grasp what we’re seeing right in front of us. Ben Roberts is Programme Co-ordinator at Camden Arts Centre and Dean of Brown Mountain College of the Performing Arts.